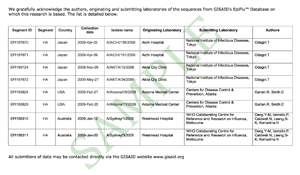 GISAID users are required to acknowledge the contributions of both the Submitting- and the Originating laboratories. An example on how to acknowledge can be found here. Since GISAID also promotes the collaboration among researchers, all users have committed to make best efforts to collaborate with representatives of the Originating Laboratory responsible for obtaining the specimen(s) and involve them in such analyses and further research using such data. An email functionality, to contact Submitters directly, is provided at the very bottom of the page of each virus dataset. Selecting “Acknowledgement table” in the EpiFlu download area allows users to download an Excel file with acknowledgement notations for all selected isolates and sequences. When referencing GISAID sequences used in an analysis submitted for publication, it is possible to insert into the manuscript a permanent electronic link, also known as a deep-link. It will enable readers to conveniently link to the actual data in the EpiFlu™ database.